Wormtec worm farming and vermiculture has developing our liquid organic worm extract microbial fertiliser & worm based soil improvers for over ten years now, both are organic and biology based. Biology based now this is where I believe the future lies in rebuilding depleted Australian soils. Wormtec worm farming and Vermiculture have been working with Gardeners, Community Gardens, Schools and Garden clubs all around Australia, assisting growers to find the missing link on how to grow a healthy garden easily, the problem been we have the worst depleted soils in Australia on earth, but they can easily be made fertile if you understand how soils work, and what controls soil fertility. Our Home Garden Fertiliser: Rebuilding Healthy Garden Soil and Fertility. The first step to rebuilding our depleted garden soils is rebuilding the microbial life that was once in our soils, we should be looking at our soils as the biggest asset we have in the garden, without healthy fertile soils you will never grow healthy plants you will be treating the plants for the same problems every year. As gardeners we should never imposing detrimental gardening practices on our soils. If you look after your garden soil the soil will reward you with healthy plants and fresh nutrient dense vegetables. When you dig in your garden are you seeing earth worms, if not this is the first indicator of low microbe numbers, low soil fertility and soil garden health. its commonly believed that worms eat organic matter when in fact worms eat microbiology, this are the organisms that are braking down the organic matter in the garden soil and turning it into humus. The problem with modern gardening practices is the use of synthetic fertilisers and chemicals to make it easier to grow plants, when in actual fact these synthetic compounds that are added to the soil sterilize the soil and kill off all the microbial life in the soil. once you kill off the microbes in the soil you will no longer have earth worms. The microbes job in the soil is to cycle the nutrient and minerals in the soil and to break down and shred the organic matter turning these materials into a soluble form for plants to be able to absorb through the root wall. so the life in the soil is making organic fertiliser for your plants to be able to grow. the microbes and worms also move these materials around in the soil taking it down deeper into the soil, opening up the soil so it holds more air and water and allowing plant roots to penetrate deeper into the soil profile to assess more water and nutrients when conditions are dry. Both machinery and foot traffic cause compaction, but the biggest cause is long term and over use of synthetic fertiliser. Soil compaction and sterilizing the soils microbial populations is caused by synthetic fertiliser and chemical abuse to your soil. Soil microbes live on each and every soil particle in a healthy garden soil and they open up the pore space between each and every soil particles; this then allows air and moisture to penetrate into the soil profile, the microbes and worms also take organic matter down into the soil profile , this helps to break up clay soils and adds organic matter to sandy soils improving its water holding capacity this also allows the plants roots to go down further into the soil profile after these compacted zones are opened up by soil microbes. Yes. Soil PH is critical and basically controls the soil function, as soon as your soil PH swings away from neutral and gets above 8 and below 5 your soil microbe start to go dormant, so once this happens your nutrient cycling stops, also mineral availability is at its largest availability at around PH 6.4 so this is where I like to have my soils, as your PH swings you also get chemical lock up in your soil, so the minerals and nutrients are there but unavailable for your plants to use. Microbes coat each soil particle with a mucus layer that absorbs water this retains more moisture in the soil profile, also because the microbes open up the soil and allow more moisture deeper into the soil profile more water is stored for your garden use, with far less evaporation and as the microbes take organic matter deeper into the soil profile the soil retains more moisture. 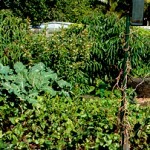 Is your garden under pest and disease attack. What about Biological Control? Synthetic fertilisers kill off microbes and increase compaction and swing your Ph from where it should be, so soils with low microbe numbers, will be unable to defend or out compete the diseased organisms both bacterial and fungal when they arrive in your garden, you are then forced into treating with more chemicals that also have a detrimental affect on your soil and microbe numbers. We utilise biology contained in our liquid organic worm extract as a bio-control helping to protect the seeds, seedlings and plants from both pest and disease attacks, by helping to increase plant brix levels and supplying the nutrients and minerals in a soluble plant available form, the microbes will also consume disease spores from the soil and crop when in good numbers. Build the microbial life in your soil and they will build soil health. Rebuilding soil microbe numbers is the key to soil fertility, if you are seeing mineral deficiency or pest attacks on your plants and vegetables it can always be traced back to mineral difesency in the soil, don’t treat the problem you see on a plant, fix the problem once and for all, by repairing the soil. Organic matter is broken down by microbes and turned into humus or plant food, the soil microbes and worms will also consume and eliminate any disease organisms contained in this organic matter or manures that you have put on your garden, but with synthetic fertiliser use and chemical abuse on your garden and soil you kill off the microbe numbers and are left with organic matter and manures that contains disease spores that will attack your next crop if planted into. Organic matter can not break down with out decomposing microbes, so this organic matter will just lays on the surface of the soil. Now this is where Wormtec worm extract will help you. Its Microbial based. By using worm extract on your gardens and plants you are replacing the missing species of microbe that have been killed off with the extra benefit of soluble nutrients and minerals in an easy to apply liquid. We are the only producer of worm extract fertiliser in Australia, most other worm based products you will find in Australia are worm leachate type products. By reducing synthetic chemical use and building soil health you can build microbe numbers and rebuild your soils for more sustainable gardening whilst reducing your costs.